Where to start this one? It’s one of the finest albums in the Grace Jones catalogue, has classic after classic that you know inside out, has incredible playing and production and is probably one of the greatest albums out there. Just look at the names involved musically; Grace herself, Sly & Robbie on bass and drums, Sticky Thompson and Mikey Chung on rhythm guitar and percussion, Wally Badarou and Barry Reynolds on keys and lead guitar and Alex Sadkin and Chris Blackwell on production. On top of that it looks stylistically amazing with its strong painted cover based on a photograph taken by Jean Paul Goude – the perfect visual accompaniment to the cover of Flash In The Pan’s ‘Walking In The Rain’ (“Looking like a woman, feeling like a man”) sitting inside. 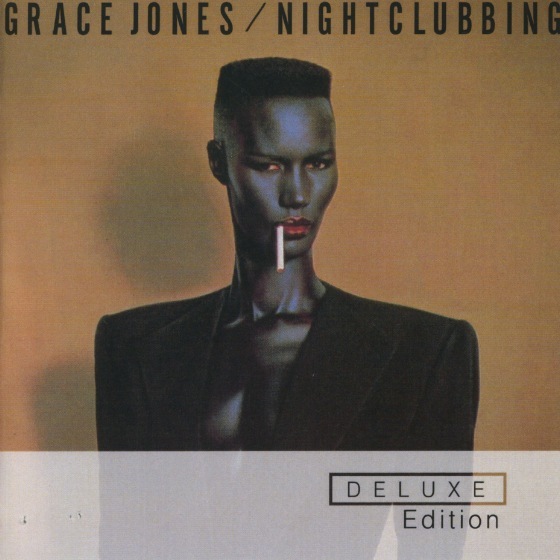 Blackwell wanted to sign Grace Jones after seeing an image of her – not after hearing her voice. “I needed to find out who she was because people said she was a singer, so then I looked her up. She had just finished a record for a little label in Brooklyn – it was her version of ‘La Vie En Rose’ by Edith Piaf and I thought that it was just incredible.” He was right. It is easy to forget with Grace Jones that often there is a lightness of touch due to the power of the visuals and the way she was portrayed, but Jones could really really sing. The track listing on this album speaks for itself. I imagine many of you know every single track on here but just look at it. It’s pure gold. And we mustn’t forget that its pure gold in a hugely different way. This was music built on the foundations of reggae in Sly and Robbie’s drums and bass but with the European sounds of Barry Reynold’s raw guitar tones and the synth sensibilities of Badarou riding on top with in the middle the perfect percussion input of Sticky Thompson and rhythm guitarist Mike ‘Mao’ Chung. Thompson and Chung had a more subtle input but 100% their parts are as important as everyone else’s. The gentle push of Thompson’s percussion in the chorus of ‘Pull Up To The Bumper’ being a case in point. Sly and Robbie by then had been playing together for many years. As tight as you like, they used body language to feel out the initial grooves. If it was cooking it was on. If not, ‘Next!’. No hanging about. As Badarou explains, “Blackwell would come with piles and piles of cassettes and we’d throw them in the cassette player and say ‘what about this’ and you’d have Sly and Robbie nodding at each other going ‘uh huh, uh huh’ then ‘fire! lets go!’ as they knew how to approach it. And then everybody had to be ready.” That to me is why these records have the feeling they do. The capturing of a performance of a band that gelled and also sounded exactly as the company boss Blackwell had heard in his head. So the extras. Two unreleased tracks in ‘If You Wanna Be My Lover’ (which has the feel of one of her earlier Tom Moulton produced tracks) and ‘Me! I Disconnect From You’ a cover of a track originally by Gary Numan’s Tubeway Army. I wonder why the later track didn’t make the cut as it would have been totally at home within the album. It’s that good. On top of these two tracks you have a few versions of ‘Pull Up To The Bumper’ (and also it’s original instrumental take in ‘Peanut Butter’), 12” versions of ‘Libertango’ and ‘Use Me’ and more. We could go on and on about the sessions for this record and about those involved but we’ll save that for a later date and just point out that its safe to say its a classic. A 100% classic record. Amazing performance, playing, production and sleeve. Top to bottom it is what Island Records at their best were all about. When this album was release in 1981 it must have sounded ridiculously fresh but listening to it thirty odd years later it hasn’t dated one bit. Just perfect. 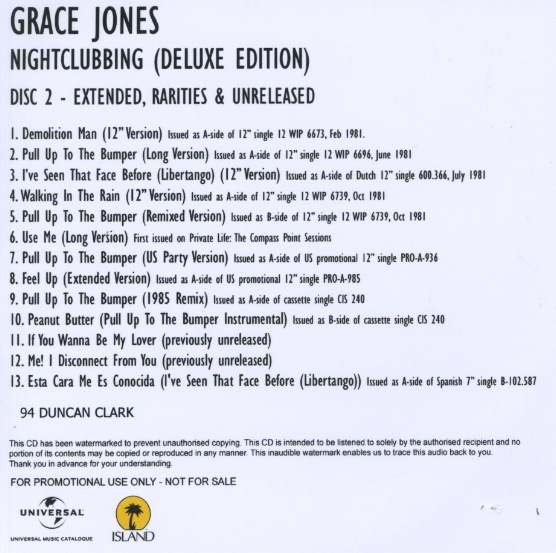 Grace Jones ‘Nightclubbing’ (Deluxe Edition) is released on Island Records on April 28th.